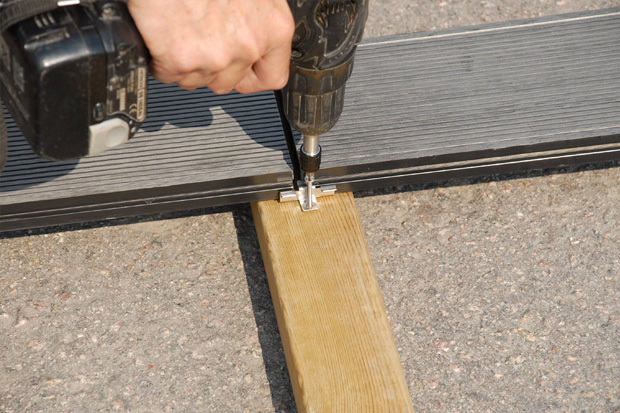 It is very important to follow the instructions during the installation of your new outdoor flooring. Incorrect installation may cause inferior strength, shorter life expectancy of the product and cause damage in the material. Installation is also a prerequisite for the warranty to be valid. 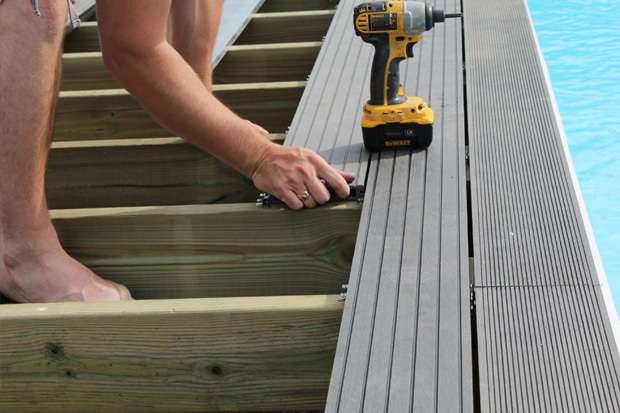 Bamboodeck is very easy to install, you can do it yourself. 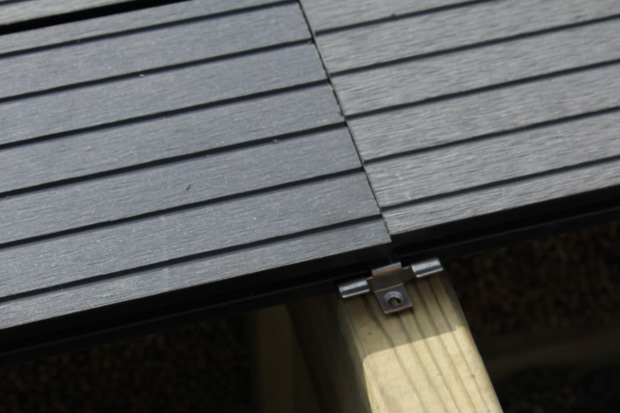 The principle is very much like installing standard decking. You do not need any special tools, just tools that you normally use to woodwork. Learn more about the assembly process and the care instructions below. By using our mathematic formula you will easily estimate your material consumption. Screws are included with the clips. When splicing lengthwise a gap of 5 mm is recommended. If you are mounting Bamboodeck on composite faders there shall be double faders under the joint. 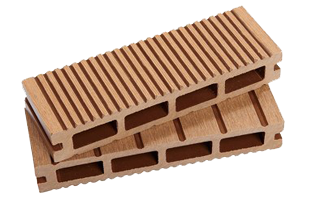 Bamboodeck has the dimension of 2.900 x 15 x 25 mm. The first board is attached with start clips then further assembled as pictured. Each board is locked with clips that are screwed into the underlying fader. Screws and fasteners in stainless steel are available as standard accessories. It takes about 24 screws / fasteners per m 2 . Usually, construction is based on the framework of the same design and dimensions as the installation of normal decking. NB. CC distance between the studs should be 30 to a maximum of 40 cm. When installing over concrete, balcony flooring, etc. composite faders are recommended. It is also important that the surface is flat. 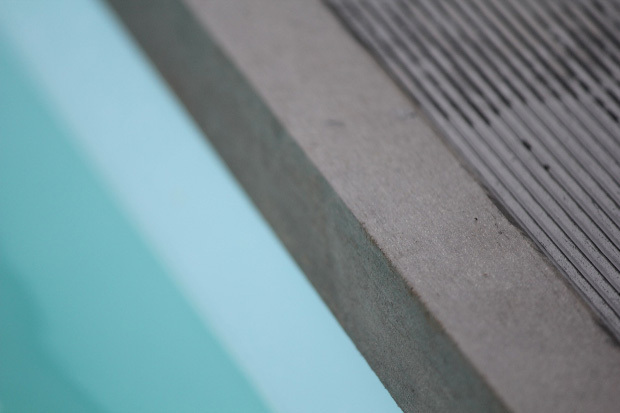 To avoid water near the foundation wall, a slope of approximately 5 mm per meter is recommended. Also remember to leave 5 - 10mm space for foundation walls. Bamboodeck is maintenance-free, but as with any outdoor flooring, in need of regular care. Hot water and scrubbing brush or pressure washer is recommended. Use dish soap, warm water and a scrub brush. Use regular detergent to clean outdoor wood flooring. Scrub with hot soapy water. If necessary, use regular "deicing salt". If necessary, use detergent with oxalic acid or degreaser. The agent may act 10-15 min. Mix some bleach in hot water according to the manufacturer's instructions. Scrub the stain hard and thoroughly clean.